My name is Jake. I am going in to my senior year at Tuscarora High School. I want to work with animals after I finish high school so I hope to go to Hood college for my biology or biotechnology undergrad degree then I hope to go to veterinary school at Ohio State University. I have one dog Dora (a boxer lab mix) and one cat George who are both patients at Kingsbrook. I greatly appreciate the chance to help out here at Kingsbrook and thank all the staff for helping me learn what it is like to work in the field of veterinary medicine. This entry was posted in High School, Jake, Volunteer on July 31, 2008 by yourfriends. We would like you to meet Sasha. 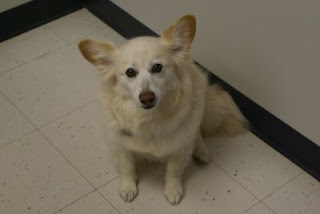 She is a 9 year old Spitz and she doesn’t look a day over 5. What is her secret? Sasha eats a high quality diet, gets plenty of exercise and pampers herself at the spa. Aren’t I pretty? Thanks to Dr Davis and his staff at Kingsbrook Animal Hospital (who keep me healthy and happy) for recommending Bernie’s Grooming. Bernie gave me a shampoo, blow-dry, styling, manicure and pedicure. She also greeted me with a smile and a treat. Even my crate was spotless! Bernie I look forward to seeing you again. Sasha visits Bernie Rogers for all of her grooming needs. Ms. Rogers is an experienced groomer and all of her four-legged clients love her. If your dog is a show dog or just wants to look like one, call Bernie at 301-748-9655 for pricing information or to schedule an appointment. 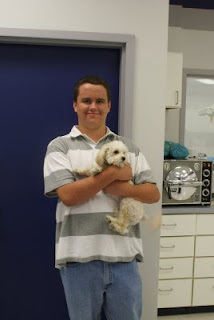 This entry was posted in Bernie Rodgers, Grooming, Sasha on July 28, 2008 by yourfriends. * Labrador Retrievers, or Labs for short, are considered the most popular breed of dog in the United States and many other countries. * Their intelligence and good temperament make Labs a very popular breed of working dog. Labs are trained to become assistance, police, military, rescue and detection dogs. 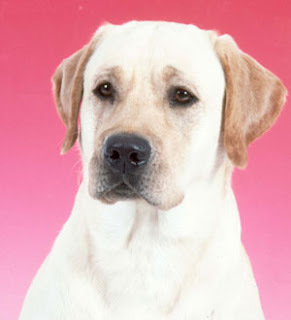 * Native to the island of Newfoundland, the early Lab was called the St. John’s dog. In the 1800s, St. John’s dogs were crossed with other sporting breeds and became known as the Labrador Retriever. * Labs were bred for retrieving in a water environment and as companions in waterfowl hunting. Their otter-like tail and webbed toes make Labs great swimmers. * There are two lines of Labs: English and American. English Labs are shorter and stockier compared to their American counterparts. * There are three well recognized colors of Labs: black, yellow and chocolate. * Labs tend to shed their coat twice a year or regularly throughout the yeat in temperate climates. Labs shed quite a bit. Endal, a service dog in England who was the first dog to ride on the London Eye. He has been interviewed by hundreds of media crews from several different countries. Jake, a black Lab who worked in Ground Zero in search of survivors in the 9/11 World Trade Center attacks. appeared on NBC’s today Show to demonstrate their talent. Former U.S. president Bill Clinton had two labs: Buddy and Seamus. Russian President Vladimir Putin had a pet Labrador named Koni. This entry was posted in Fun Facts, Labrador Retriever on July 25, 2008 by yourfriends. You may notice some fresh faces around the hospital during your visit. Julie is a 2008 graduate of Wilson College in Chambersburg, PA (KAH technicians Ranee and Sara received their degrees there). She is completing an internship with us to hone her technical skills and will receive her diploma in August. Julie recently sat for the Maryland State Board Examination for Veterinary Technicians and is anxiously awaiting her results. 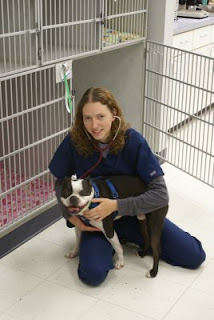 Upon receipt of a passing score, Julie will become a Registered Veterinary Technician (RVT)in the state of Maryland. The doctors and staff of Kingsbrook Animal Hospital would like to welcome Julie to the field of veterinary medicine and wish her best of luck in her career. This entry was posted in Interns, Julie, Wilson College on July 22, 2008 by yourfriends. *The Eisenhower’s Weimeraner “Heidi” lived in the White House with the first family. *The Weimeraner is a close relative of the German Shorthaired Pointer. 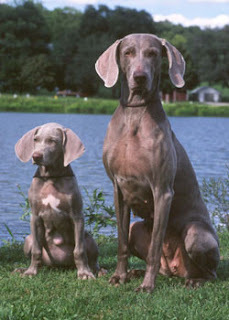 *Weimeraners originated in Germany in the early 19th century. *The breed was originally known as the Weimer Pointer. *Weimeraners are nicknamed “the grey ghost” due to their shift in coat color during different light conditions and their quiet, stealthy movement. This entry was posted in Fun Facts, Weimeraner on July 19, 2008 by yourfriends. ‘Hi – my name is Augie Doggie. I am a rescue from the Frederick County Animal Control. I had a ‘cherry eye’ in my left eye, and the wonderful and talented Dr. Kim repaired it for me! My Mom and Dad were very curious as to what my ancestry might be. They just couldn’t figure it out, so they decided to have a DNA ‘Wisdom Panel’ done. Can you guess what breeds went into my unique mix? I don’t look anything like my forebearers! As you can see, I’m black and white and I have a long torso and relatively short legs. No, not a Dachshund! I have looonnng ears. No, a Goat is not a valid choice – try again! I have a long white ‘ruff’ around my neck, and big freckles on my legs and on my pink belly. No, an Appaloosa Horse is not a valid choice either! I have a white tip on my long skinny tail, and whiskers like Mr. McGregor. Are you getting closer? I love to cuddle, and I’m a very good boy! OK, I’ll give you another hint. I can smell a piece of toast from 100 paces. And, my Mom and Dad say I’m too smart for my own good! 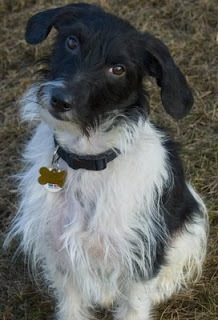 Get ready – drum roll please – I’m mostly Beagle, with traces of Miniature Poodle, Pug (! ), and Staffordshire Bull Terrier (Pit Bull)!! This entry was posted in Augie, Wisdom Panel Genetic Testing on July 16, 2008 by yourfriends. Are you looking for a new companion? Not enough time for a dog? Allergic to cats? Rabbits make excellent pets, and offer a wonderful alternative where it may be impossible to keep dogs or cats. Rabbits are clean, docile, and intelligent. However, they still require responsible care and daily attention. 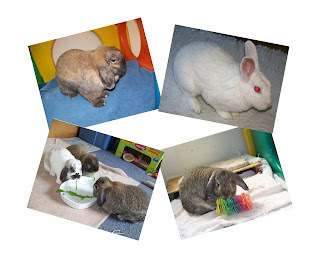 Rabbits may live 6to 15 years depending upon the breed. Since there are over 40 recognized breeds of rabbits, check with a reliable source to determine what type would fit in with your lifestyle. The most popular are the smaller breeds, such as the Dutch, Holland Lop, Mini Lop, Netherland Dwarf, and Polish. Rabbits may be taught to use a litter box, and may be leash trained for trips outside the house. This entry was posted in Uncategorized on July 13, 2008 by yourfriends. *Dogs resembling Basenjis are depicted on the tombs of Egyptian Pharoahs dating back to 3600 BC. 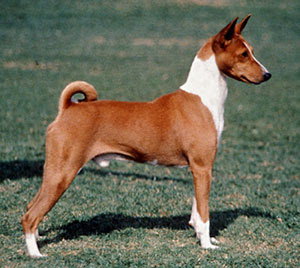 *Basenjis originated in the African Congo where they are still used by pygmies to hunt lions. *While Basenjis are known as the African barkless dog, they are by no means silent. They are usually very quiet, but can yodel or baroo when they are happy to see you. If they are displeased, they do whine and grumble. *They have a strong prey drive and will chase anything that moves: other dogs, cats, rabbits, squirrels, birds, etc. Lure coursing is the sport of choice. * The Basenji may be the only breed where their owners brag about the destruction they wreak. New owners quickly learn to put dirty clothes in the hamper, the remote in a drawer and the garbage behind a closed door. They also learn that a tired dog is a good dog. This entry was posted in Basenji, Fun Facts on July 10, 2008 by yourfriends. 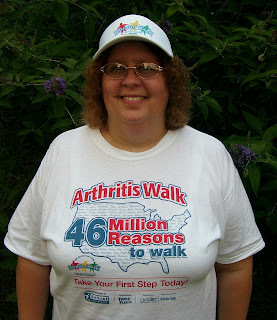 I just wanted to thank everyone who supported me in the Arthritis Walk. With your help, I was the top fundraiser in Hagerstown this year. I raised $548 that goes directly to the Arthritis Foundation for their programs. They even asked me to sit on the committee to plan the event next year. Donna Morgan of Frederick was the winner of the Americana Drink Dispenser raffle. A big thank you goes out to everyone who purchased a raffle ticket or made a donation to this worthy cause. If you are or someone you love is affected by arthritis, there are many programs available to help. Visit www.arthritis.org for more information. This entry was posted in Arthritis Walk, Ranee on July 7, 2008 by yourfriends. 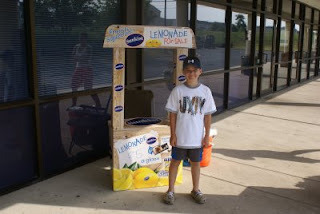 This entry was posted in Dennis McAfee, FCHS, Lemonade Stand on July 4, 2008 by yourfriends.